This is a 46-year-old monocular man who presented with floaters, peripheral vision loss, and decreased central acuity in his left eye. Nine months prior to presentation, the right eye had suffered a penetrating globe injury with retinal detachment and was enucleated within four weeks of the injury. His slit lamp exam demonstrated anterior and posterior chamber cell (Figure 1). 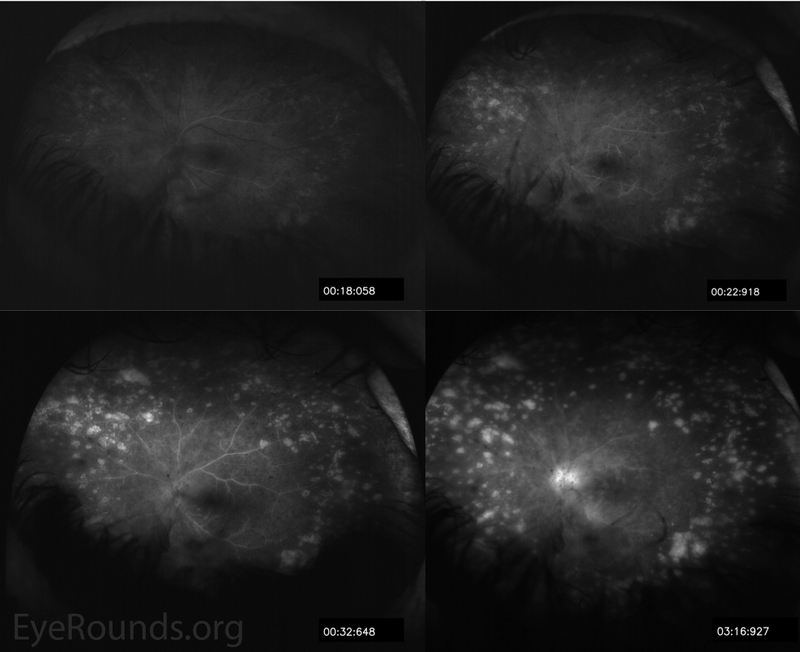 Dilated fundus exam revealed vitreous strands, grade III disc edema, and multiple, discrete, peripheral hypopigmented lesions consistent with Dalen-Fuchs nodules (i.e., lymphocytes and epithelioid histiocytes present between the RPE and Bruch membrane) (Figure 2). Fluorescein angiography demonstrated staining of the multiple peripheral lesions and leakage from the optic nerve and vessels in the posterior pole (Figure 3). Despite initial treatment with mycophenolate mofetil (CellCept) for several months, the patient experienced worsening peripheral vision and persistent vitreous inflammation. He underwent surgical placement of a ﬂuocinolone acetonide intravitreal implant (Retisert) for local, long-term inflammation control. Sympathetic ophthalmia (SO) is a rare, granulomatous panuveitis that usually occurs within one year of penetrating trauma to the fellow eye, likely as a result of uveoretinal antigens entering the conjunctival lymphatics [1, 2]. In addition to trauma, pars plana vitrectomy and other intraocular procedures are associated with increased SO risk . Other characteristic findings of SO that were not present in this case include serous retinal detachments and mutton-fat keratic precipitates. Please refer to the Eye Rounds case on sympathetic ophthalmia for further information regarding work-up, differential diagnosis, pathophysiology, and management. Figure 1. Slitlamp photography, left eye. There was 1+ cell and 1+ flare in the anterior chamber with trace nuclear sclerosis (left image). The vitreous exam was remarkable for significant anterior vitritis (right images). Figure 2. 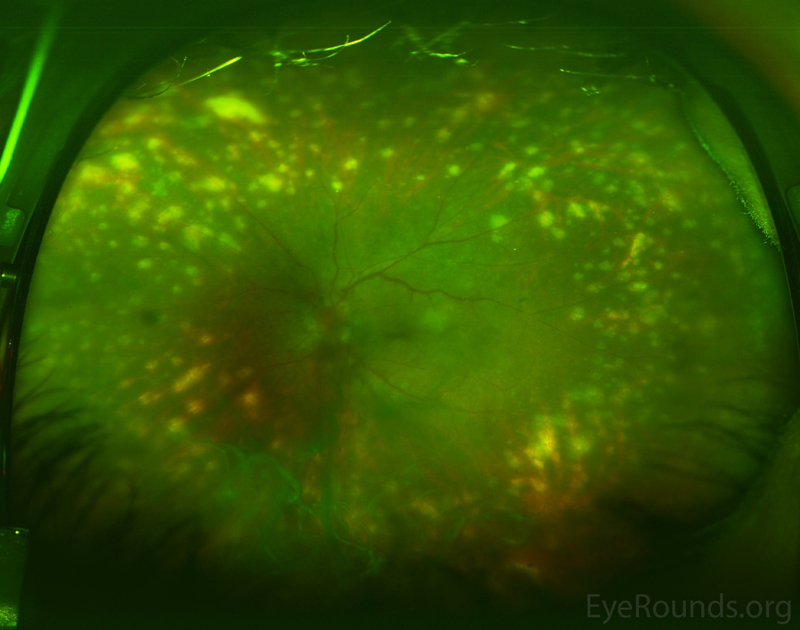 Optos ultra-widefield pseudocolor fundus photography, left eye. There were numerous hypopigmented, atrophic-appearing chorioretinal lesions throughout the mid- and far- periphery that were consistent with Dalen-Fuchs nodules. There was grade III disc edema, venous engorgement, and peripheral vascular attenuation. Figure 3. Fundus fluorescein angiography, left eye. Irregular filling of the choroid was present. There was leakage from the optic nerve and vessels throughout the posterior pole. Hyperfluorescence of atrophic areas was seen. Figure 4. Optical coherence tomography of the macula, left eye (OS). 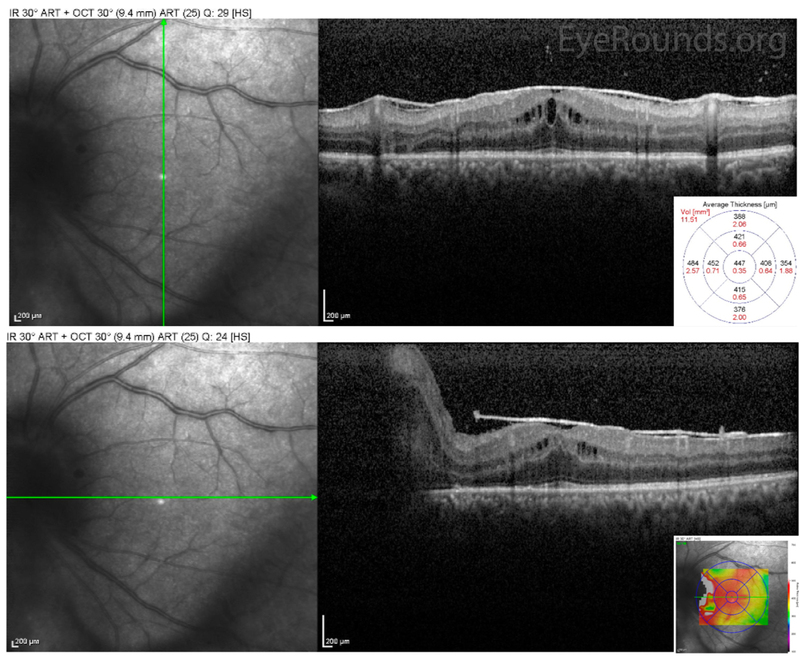 There was a moderate epiretinal membrane with mild intraretinal fluid and loss of the foveal contour OS. There was marked disc edema with fluid tracking into the nasal macula OS; however, no subretinal fluid was present subfoveally.